Time to dust off those old carts -- just leave 'E.T.' where it is. If you want to play retro Atari 2600/VCS games, you're not short on options. There's eBay for the original console, of course. You can play some on mobile, buy one of those Flashback all-in-ones or splurge on the ultimate man/woman cave table. But for those who have the original cartridges but don't want to keep an old console on permanent life support or tinker with modifications under the hood, your options aren't so good. Enter the RetroN 77 -- the VCS reimagined for the modern age. Importantly, it plays most if not all of the original game cartridges in glorious 1080p and at a modern aspect ratio, right out of the box. It's pretty hard not to get misty-eyed while playing Pac Man off the original cart, complete with faded, battle-worn label. The experience is even better when it plays in full screen on a modern TV without having to jump through any hoops. Hyperkin, the company behind the hardware, has a long history of making modern versions of classic consoles (the SNES and Genesis in particular). You can be sure there's attention to detail too with the RetroN 77. I'm reliably informed that those who remember moving the cart in their original Atari (and causing the game to glitch) might get the same experience here (if you want). 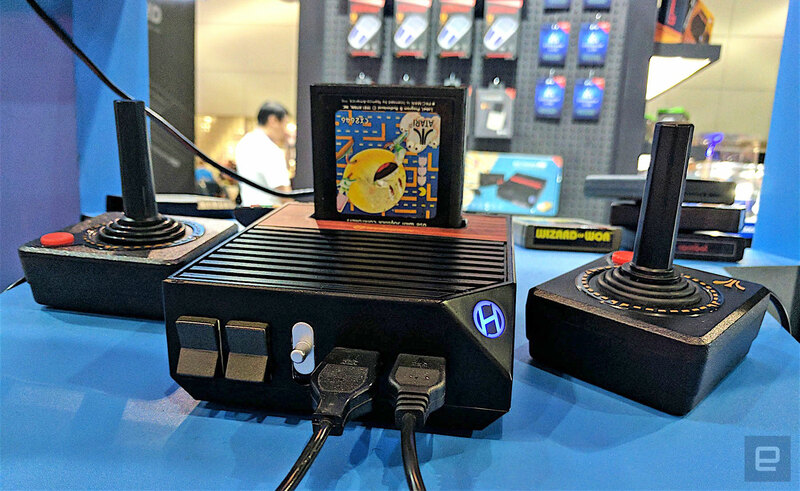 Really, though, the RetroN 77 is about fun and keeping the Atari legacy alive -- and given the recent reveal of Ataribox, it's something lots of people are passionate about. Yes, you can use original joysticks, but there are USB options as well, if going full authentic with vulnerable hardware is a step too far. Hyperkin wouldn't commit to a price but suggested the RetroN 77 should retail somewhere around $80, landing just in time for you to get one (for your kids, of course) for the holidays.